followed by articles and letters. 9/30/04 This hydrograph is the Shasta View Irrigation District recorder well site about 3 miles NW of Malin and 3.75 miles north of the state line sent to KBC by Ned Gates, Hydrogeologist, Oregon Water Resources Department. Thanks to the 2001 water shut-off, and to the mandatory land idling/aquifer pumping called 'water bank', our aquifer is being depleted. Several wells went dry of disabled this year and around 200 wells in 2001. Go HERE for larger graph. 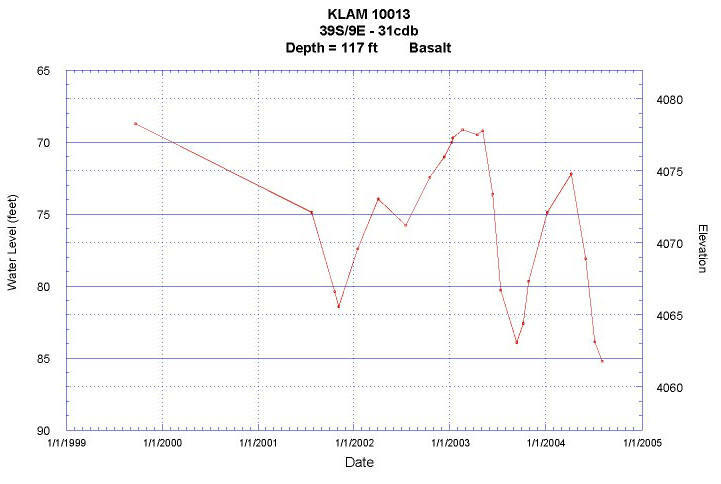 8/30/04, This is a hydrograph of a well near Midland, just south of Klamath Falls. This was sent by Ned Gates, Hydrogeologist, Oregon Water Resources Department. Since the 2001 irrigation water shut-off, and the mandatory water bank which forces basin irrigators to idle farmland and pump groundwater, our aquifer is lowering 5 feet per year. For large graph, go HERE. 8/21/04. According to Ned Gates, Hydrogeologist, Oregon Water Resources Department, with the annual mandatory, Bureau of Reclamation-imposed 'water bank', our aquifer is being depleted by 5' per year. It is not recovering. Next year we are forced to idle land and pump ground water totaling 100,000 acre feet. miles north of the state line and about 4 miles northwest of Malin. The big drop was 2001 water shut off. For larger graph, go HERE. $10.3 million in drought relief OK'd, H&N 5/4/18. 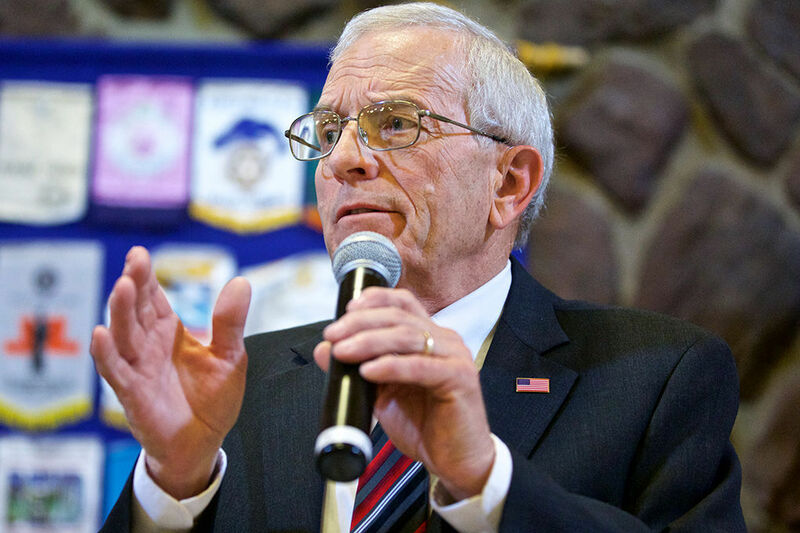 "The top-level approval frees up the funds for the Bureau of Reclamation to issue a proposal to distribute the money to on-Project irrigators, Walden said. A proposal from Reclamation could be released as early as Friday or on Monday at the latest... The money is slated to fund pumping, land idling, and disaster relief." Judge rejects claims of Klamath Basin irrigators, H&N 9/8/17. "...The plaintiffs argued their wells were drilled into a confined aquifer that’s separated from the Sprague River by layers of rock and clay, as well as a shallower alluvial aquifer. Shutting down the wells isn’t allowed because OWRD only has jurisdiction over wells drilled into an aquifer “adjacent” to the surface water..." “There’s nothing to stop Oregon Water Resources from regulating every aquifer in a basin (within a mile of surface waters) and calling it an aquifer system,” (attorney Laura Schroeder) said." Local rancher, Tom Mallams, challenging well shutdown, H&N 7/19/17. "...Mallams has petitioned Marion County Circuit Court Judge Thomas Hart to overturn OWRD’s order because it’s “not supported by substantial evidence” as required by Oregon law..." KBC NOTE: Tom Mallams told KBC News he has not been interviewed by Herald and News or Capital Press regarding this matter within the past two years. COMMENTS DUE September 4! Draft (Groundwater) Basin Boundary Regulations Released by Department of Water Resources, posted to KBC 8/21/15. "Modeling program on wells done by OWRD (Oregon Water Resource Department) is majorly flawed," Klamath County Commissioner Tom Mallams 5/17/15. "This is the same model that "claims" all the upper basin wells are also connected to surface water...At the March 23rd Senate Hearing in Salem, on Senate Bill 206 & 264, OWRD and Richard Whitman, Policy Director for Oregon Governor John Kitzhaber’s Natural Resources Office, admitted under questioning from Senator Doug Whitsett that they "hoped" their accuracy rate on this modeling program could be 50%..." KBC NOTE: Whitman is a major player of supporting the Klamath Dam Removal Agreements. Geosyntec Executive Summary 4/6/2015. "OWRD requested shutoff of two city wells...The OWRD model is flawed for municipal use for several reasons..."
* Today’s open house at Oregon Tech begins at 4 p.m., and the hearing starts at 6 p.m.
* Residents can learn about and comment on proposed groundwater rules at two meetings this week. Groundwater study group meets Nov. 18. Residents can find out more about groundwater rules, H&N, posted to KBC 11/16/14. KBC Note: The KBRA / Klamath Basin Restoration Agreement mandates Klamath Basin irrigators to have a groundwater management plan which will control how much groundwater an irrigator may use on their own property, mandating 'no adverse impacts'. What constitute an "adverse impact" will be decided by tribes, environmental groups, government agencies and a few farmers. 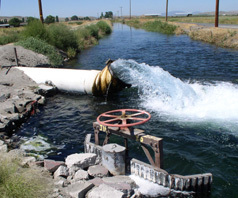 Tulelake Irrigation District has already installed this mandate of the KBRA. However, they did tell their constituents that their plan "is not a requirement of...the KBRA..." and "will not regulate groundwater within the Plan area." City OKs hire to consult on groundwater. Hydrogeologist will examine wells and geothermal aquifer, H&N, posted to KBC 8/24/14. "The consultants will help determine if city wells interfere with groundwater resources, as well as how the geothermal aquifer operates, Willrett explained. The need for the consulting work stems from the Oregon Department of Water Resources order that the city cease the use of the Fremont and Wocus wells due to insufficient stream flow into Upper Klamath Lake and its tributaries..."
Council may hire water attorney, H&N 8/17/14. "Members of City Council Monday night will consider an agreement with a hydrogeologist ... to help determine if city wells interfere with groundwater resources, as well as how the geothermal aquifer operates, as stated by the Oregon Water Resources Department." KBC NOTE: From the 2012 Tulelake Irrigation District groundwater management plan fact sheet, "The Plan is not a requirement of, and is not being developed for, the Klamath Basin Restoration Agreement (KBRA) or the "on-Project Plan" of the KBRA...this groundwater management plan will not regulate groundwater within the plan area..."
Scott Valley Groundwater, by Siskiyou County Supervisor Marcia Armstrong, posted to KBC 11/13/12. 10/8/11: KBC corrections and explanations in response to criticisms, of our 8/29 notes of TID groundwater management plan meeting, by TID and Family Farm Alliance Executive Director and engineer Dan Keppen. There are also some notes from TID's 9/20 public meeting, and the Water for Power meeting quotes and audio, by KBC editor. (Groundwater management plan is mandated in the KBRA). ELF, water board: Water is not property, Siskiyou Daily News, posted to KBC 3/27/11. Past President of Friends of the River http://www.envirolaw.org/staff.html James Wheaton, is President and Legal Director of the Environmental Law Foundation, and past President of Friends of the River. He is also a board member of the River Network, http://www.rivernetwork.org/board-of-directors , along with Wyatt Rockefeller, who served on Obama's EPA and Obama's campaign. Craig Tucker, presently spokesperson for the Karuk Tribe, at the KBRA table, is founder and board member of Klamath Riverkeeper, and was past spokesman for Friends of the River. Siskiyou County responds to ELF, water resources board briefs, Siskiyou Daily 1/13/11. "...Guarino also questions the water resources board’s alignment with the petitioning parties on a number of issues in the case...The case is Environmental Law Foundation v. State Water Resources Board, in which the Environmental Law Foundation and the Pacific Coast Federation of Fishermen’s Associations and Institute for Fisheries Resources have asked the courts to declare that groundwater in the Scott River basin can be managed under the Public Trust Doctrine." George Soros funds Earthjustice, which provided free legal services PCFFA and Institute for Fisheries Resources, litigants against Siskiyou County, and also for Friends of the River and Klamath Riverkeeper. Here is the story by PCFFA how they created IFR to get non-profit funding, namely, George Soros-funded Earthjustice. HERE is the agenda of the California Water Control Board, lead agency in the CAl/EPA Environmental justice Action Plan in the Klamath River Basin. California Farm Bureau Federation Friday Review of bills and laws 2/11/11: Williamson Act funding, County Fair funding, groundwater management, AB 316 metal theft, and AB 856 fertilizing materials inspection program. Domestic well users hit hard during growing season, H&N, posted to KBC 7/25/10. " (California) Legislative report calls for water changes; Groundwater supply not sustainable, needs permitting, by Hank Shaw, Capital Press, posted 11/2/08 "Freeman's report includes a section on how much water the same crops use in different areas. This could lead to policymakers declaring that growing a certain crop in a certain area does not qualify as a "reasonable use" of water, essentially banning it." 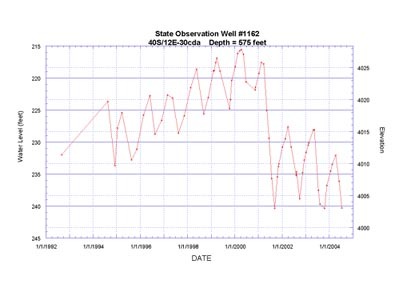 Summaries of the two House Bills (2564 and 2566) regarding water measurement of ALL wells and surface waters in Oregon, followed by House Bills, sent by Oregon Senator Doug Whitsett, District 28, posted 3/24/07. Bureau to stabilize lake levels, H&N 6/13/06. Current program not a long-term solution; Water bank program designed as stop-gap measure, H&N 5/18/06 HERE for history of the waterbank and related articles. Water bank figures start to roll in, H&N 3/8/06. (Snow pack last month was 158% of average. However the Bureau's mandatory water bank will take more than 100,000 acre-feet of water, (1/4 Project downsize) from irrigation and send it to the ocean to artificially raise the lake level and river flows because of the biological opinion driven by Dr Hardy science. KBC) HERE for Hardy page. Bureau: Project water bank succeeding, H&N 2/11/06. ( After 2001 water shutoff, the Bureau of Reclamation told Project Irrigators they must participate in the "water bank" which would downsize the Project by 1/4, or else the Klamath Project would be shut down. Is that voluntary? KBC). Water bank deadline Feb. 16, H&N posted to KBC 2/6/06. Bureau accepting water bank applications, H&N 1/18/06. State Water Commission meets Thursday in Klamath; agenda includes tour of basin, H&N 10/26/05. * Letter by Klamath Water Users to Oregon Water Resource Commission regarding Water Appropriations in the Klamath Basin, 7/27/05. *Letter by Senator Whitsett to Oregon Water Resource Commission regarding Water Appropriations in the Klamath Basin, 7/27/05. Water Bank Water Used by 9/13/05: 102,835 Acre-Feet. The Biological Opinion deemed flawed by the National Research Council demands 100,000 acre feet of the irrigators' stored water and aquifer (which is dropping 5 feet per year according to Oregon Water Resource Department). Last week TID was requested to again pump their wells by the Bureau of Reclamation, sending aquifer water into Klamath Lake and Klamath River over and above waterbank demands. TID well reports 8/25/05 TID manager Earl Donosky says they plan to finish all well pumping by Tuesday or Wednesday next week. Two families have contacted KBC because their wells have gone dry. PHOTO: Water pumped from TID well on Stateline Rd. to fulfil the Bureau's waterbank demand of 100,000 acre feet of our stored irrigation water and aquifer. Link River used to go dry in the fall before the Project was built for irrigation water storage. Put a stop to craziness, H&N 8/18/05 "The environmentalists have been trying to eliminate farming in the Basin. I feel the irrigation district and the 31 people in Oregon are playing into the hands of environmentalists. When they drain all the underground water dry there will be no more farming. Write to the government and put a stop to this craziness." Dave Sabo, Bureau of Reclamation, addressed the Klamath County Commissioners regarding Klamath water situation, 5/17/05 by Barb Hall, Klamath Bucket Brigade. A positive step for Klamath, editorial LA Times by JOHN W. KEYS III Commissioner Bureau of Reclamation U.S. Department of the Interior Washington, D.C. (Is downsizing the Klamath irrigation by over 1/3 in drought and flood years, and depleting our aquifer 5 feet per year, "positive"? Positive for who? For those who built and paid in full for the Klamath Project to store irrigation water, which allows for higher-than-historic river flows and lake levels, and makes available free regulated water for power which was not available before the project....it is not "positive." See Waterbank Page for more info. 15-percent irrigation cutback sought, H&N 4/8/05. Actually this would be a 45% irrigation cutback. The Bureau of Reclamation 'water bank' has demanded 100,000 acre feet of water from the Klamath Basin, or 1/3 of our irrigation water. Add 15%. Even after hundreds of conservation projects and approximately 100,000 acres of ag land have been converted to wetlands, the remaining irrigators have no assurance. They have nothing but fear, being targeted to supply our stored irrigation water and our depleting aquifer to send water down the river to make higher-than-historic lake levels and river flows. See waterbank page. Feds renew call to idle Basin land, H&N 2/14/05. For more on dewatering our farmland, go HERE. Bureau hopes last-minute surge will fill water bank, H&N 1/26/05. Commentary by Barb Hall, Klamath Bucket Brigade, adds this quote: "A consulting hydrologist, Mark Van Camp of Sacramento, told water users an analysis of the draft BuRec historic water flow study shows that downstream flows have increased 30 percent over discharges before settlement. That’s apparently because the irrigated land uses less water than evaporation loss from the thousands of acres of wetlands that existed before the shallow lakebeds were diked, drained and put to the plow." Trickling interest in water bank, H&N 1/19/05. "We were expecting between 450 and 500 and so far we got 20," said Rae Olsen, Bureau spokeswoman." (...that is, 450-500 bids to idle farmland. The Bureau of Reclamation is mandating 100,000 acre feet of farm water taken from farmers by land idling or aquifer depleting regardless of water year type. (* The National Research Council said lake-level/river-flow management was unjustified. * The latest lawsuit said that the coho were illegally listed. 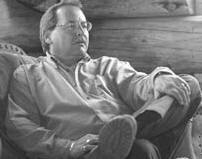 * Dr. Hardy, hired by the Dept of Justice and Bureau of Indian affairs, created a non-peer-reviewed biological opinion based on the highest recorded flows to shut down the Klamath Project. The science that the Bureau of Reclamation and National Marine Fishery Service choose to mandate is the non-peer reviewed agenda-driven Hardy 'opinion'. Water agency seeks drought declaration, Redding Record Searchlight 1/12/04. "About 100,000 acre-feet of water -- almost one-third of the farmers' annual allocations -- must be reserved for coho salmon downstream. " Bureau asks for drought declaration H&N 1/5/05. "They face a thin snowpack in the Cascades and a demand to set aside 100,000 acre-feet of water for coho salmon downstream of the Klamath Reclamation Project. So they want Oregon Gov. Ted Kulongoski to give them the OK to increase groundwater pumping to provide irrigation water that would offset the demand for in-stream water." (This could take more than 100,000 Acre Feet of water from Klamath Irrigators. The National Academy of Science said that lake-level/river-flow management is unjustified. The Bureau has not reconsulted on a biological opinion that was not peer reviewed--Dr Hardy was hired by the Dept of Justice and Bureau of Indian Affairs to go against the farmers in the water adjudication and to form a biological opinion to shut down Project Irrigation. THAT is what they are basing this water theft on. Go to "water bank" page...the mandatory water theft is depleting our aquifer 5' per year according to Ned Gates and the Oregon Water Resources Dept. Oregon State University Klamath Experiment Station field day; Klamath aquifer being depleted, river flows historic high, new crops and methods and adjudication discussed KBC News 8/6/04. "Marbut, OWRD, 'We are in a short term depleting the aquifer." Sabo, BOR, "We ran a lot of water down the river, and if we'd known how the water situation would shape up, we wouldn't have done that." Sabo, "They (U S Fish and Wildlife Service) haven't done a recovery plan on suckers since 1994."... "There's plenty of suckers around. I think if they were looking at the population of suckers today, they wouldn't be listed." Klamath Basin Water Management by Doug Whitsett, President, Water for Life,Inc. "However, the shortage is not being caused by cattlemen, dairymen, and farmers as they suggest; rather, it is being caused by the management errors of our own government. Let us count the ways that our most precious natural resource continues to be wasted through mismanagement." "To keep flows up for salmon in the Klamath River, the U.S. Bureau of Reclamation has been paying some irrigators to switch to ground water to help fill the 75,000-acre-foot vault of its "water bank." And, some say the pumping is bring down the water table, leaving some pumps in domestic wells sucking air, not water." Water bank assets run low, H&N 5/14/04. PRESS RELEASE: Inflows Dictate Change in Water Year Type, from Bureau of Reclamation posted to KBC 5/10/04. (It is our understanding that a large amount of water was dumped into the river this winter over and above requirements. 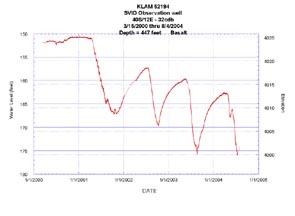 So now there is, once again, panic to obtain much more than the 75,000 acre feet of water demanded of the Klamath Basin irrigators to hold in the lake to meet the BO's contrived by the proven-flawed Hardy Science. All of the TID wells have been pumping for a week. KBC-jdk). Lake inflow, groundwater, both falling, H&N 5/6/05, Dan Keppen, KWUA, "Nobody at the local level is going out and promoting groundwater pumping," he said. "We want that Klamath Project surface water." More water historically evaporated from our lakes than is currently used for agricultural purposes in the Klamath Project. Historically, Link River occasionally went dry. Mining water in the basin, Mail Tribune 5/5/04. KWUA Dan Keppen responds to Mail Tribune editorial 5/5/04. "The artificially high lake and river flow levels supported by the water bank– such as those that contributed to the 2001 curtailment of Upper Klamath Lake irrigation supplies - have been questioned by the National Academy of Sciences." Water bank leads list of irrigator concerns, 2/2/04, H&N. Written by Deb Crisp, executive director of Tulelake Growers Association. "We continue to struggle with a "water bank" that requires an unreasonable 75,000 acre-feet for 2004 and 100,000 acre-feet for 2005. This and numerous other issues are cause for great concern while we work to revive our highly productive agricultural lands and business community." PRESS RELEASE: Reclamation announces its 2004 Klamath Basin Pilot water bank program. 1/16/04 "The Bureau of Reclamation is soliciting bids for the 2004 Pilot Water Bank. The Water Bank’s purpose is to comply with the 2002 NOAA Fisheries Biological Opinion on Klamath Project Operations. In 2004, the Biological Opinion calls for a water bank of 75,000 acre-feet."